Record-breaking CONGA at the market! We’re issuing a code-red CONGA ALERT for this Saturday’s handmade & home market, as a world record attempt in the making is stopping by for a visit! 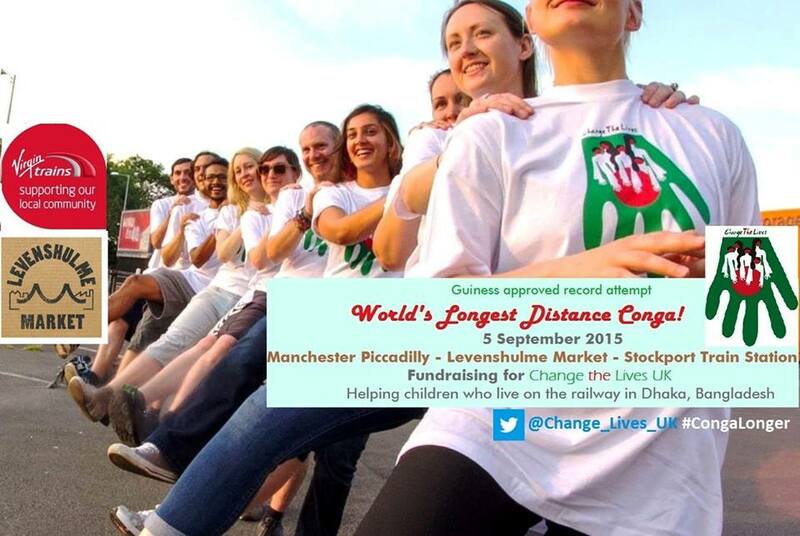 A dedicated team, representing Change the Lives (CTL) and Virgin Trains, are aiming to conga all the way from Manchester Piccadilly Station to Stockport Station, popping by our lovely little Manchester market and of course, Levenshulme train station, on the way. The conga line will be making its way down the A6, with a total distance of 6.1 miles to cover. And where better to stop for brief refreshments than our market, where volunteers will be wiping sweaty brows and dispensing shoulder massages to the tired team, as well as raising awareness and accepting donations at their own stall. Once they reach Stockport station, the party continues with another fund-raising event – Stockfest, a free community festival. Come to the market and then bob down the A6 to Stockfest- its the perfect day out in Manchester! This is a bold fundraising effort, all in aid of helping to improve the lives of children who live on the railway in Dhaka in Bangladesh. Plus, there’s a Guinness World Record attempt for ‘World’s Longest Distance Conga’ up for grabs! We hope you’ll all be there at 12.30pm to cheer on the team as they make their way through the market – this is a challenging but very entertaining way to raise money for an excellent cause, so all support will be much appreciated. To find out more about the fundraising attempt, take a look here.